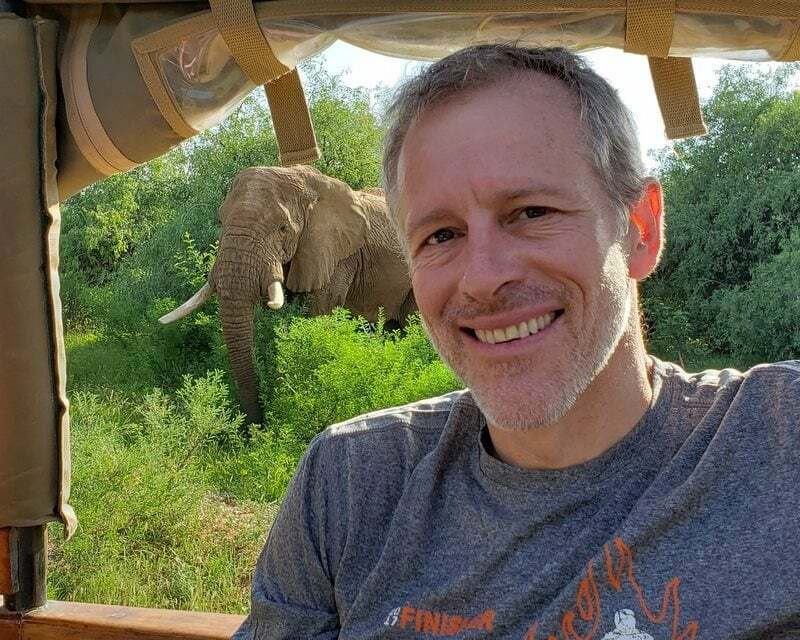 Whitney Tilson’s email to investors discussing one of Stansberry Research’s top gurus, Steve Sjuggerud, is very bullish on Chinese stocks; and a bull and a bear on Tesla. Last June, Steve Sjuggerud and I traveled 754 miles by train from Beijing to Shanghai – about the same distance as New York to Chicago. But unlike taking a 19-hour Amtrak train in the U.S., the trip in China took less than five hours. It may surprise you to hear that China is living in the future and the U.S. is playing catch-up. The train wasn't even the most shocking part of the trip, though... It was the little villages that we sped by. It's the view of China that most Americans expect. Out there, you get a glimpse of the country's working poor. But next to each village, we saw something odd... New construction interrupted the Chinese countryside nearly every time. "How do they build so much at once?" I wondered. We'd pass a little village. Right next to it would be clusters of cranes – each one working on a massive building. That sounded farfetched at first. But it's working... China is literally lifting its citizens out of the dirt and up into the sky. About 30 million people are still below the Chinese poverty line. Now, the push is to get those folks above the threshold. This isn't just one politician's promise, though... It has been the entire party's focus for decades now. 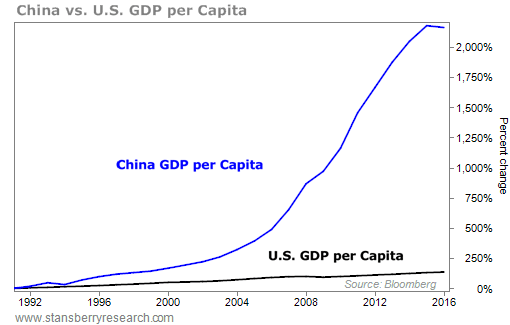 All you need to do is look at China's growth in per capita gross domestic product (GDP). China is getting wealthier. And it's happening fast. As regular Digest readers know, a major shift is coming. A weird "quirk" in the financial markets is pushing investors into China... whether they like it or not. You see, for decades the biggest investors in the world have steered clear of China... And not for the reasons you'd expect. It wasn't because of debt or the housing market. It wasn't due to human rights or any other Chinese economic boogeyman. The reason was simple: Chinese stocks weren't part of the global stock indexes. They hadn't been added to the list. The reasons behind that are complicated and esoteric. But it meant that no foreign passive investments ever made their way to China. It was one of the biggest financial wrongs of modern times. And it was bound to be righted. At first, Steve was the only one telling this story. But now, global investment bank Morgan Stanley (MS) is starting to get on board. It started with a cryptic Bloomberg headline, which read: "China A-Shares Will Be One Tenth Foreign Owned in Ten Years: MS."
That might not sound so dramatic... But in reality, it's a huge deal. And it means up to $2.2 trillion is set to flow into China in the years to come. There's a catch, though... Most of those gains came from a boom in Chinese tech stocks. The bigger shift in China hadn't begun yet. Today, we're in a different environment. Global stocks – U.S. and China included – are recovering from a correction. And once again, investors are spooked. That's great news. It means the setup in China is better than it ever has been before. Morgan Stanley sees foreign ownership of China A shares reaching about 10% in 10 years from the current level of 2.6%, with annual A-share inflows normalizing at around $100 [billion to] $220 [billion]. Until now, the big U.S. investment firms had been nearly silent on this. Now we know what Wall Street really thinks. And Morgan Stanley is starting to make some bold predictions... $220 billion per year would mean more than $2 trillion could ultimately flow into Chinese A-shares over the next decade. This is huge news. And it gives us the perfect opportunity to put new money to work right now. As I've said for years, we know a flood of money is heading into Chinese A-shares... So let's get our money there first. I believe we will see a triple-digit gain within an 18-month period sometime over the next five years, thanks to the shift Morgan Stanley sees coming. And that's likely a major understatement. China has a history of soaring hundreds of percent quickly... And a couple trillion dollars in inflows is the kind of thing that could kick off a frenzy. Of course, we can't just blindly hold A-shares for years while the shift occurs. That's too risky, considering how extremely volatile Chinese stocks tend to be. What we want to do is be invested when the uptrend is in our favor... and step aside when things get tough. Steve has repeatedly called the opportunity in Chinese stocks "the biggest investment opportunity of his lifetime." I believe him. I've visited China with Steve twice now. I've seen it all firsthand. The shift taking place in China is multigenerational. We likely won't see anything like this again in our lifetimes. Steve has been preparing for this since 2016. And he has assembled a list of stocks and funds to best take advantage of this massive shift. Massive changes are coming in the Chinese markets. Up to $2.2 trillion will flow into Chinese stocks. This is a once-in-a-lifetime opportunity... And it's happening right now. Don't let it pass you by... For a limited time, you can access Steve's China research at a 33% discount to what it normally costs. Get all the details right here. New 52-week highs (as of 3/20/19): General Mills (GIS), Ionis Pharmaceuticals (IONS), Kinder Morgan (KMI), iShares iBoxx Investment Grade Corporate Bond Fund (LQD), Nestlé (NSRGY), Starbucks (SBUX), and Wheaton Precious Metals (WPM). A busy day in the mailbag: More feedback on Wall Street research... skepticism about the Federal Reserve's latest move... and some kind words from a longtime subscriber. As always, send your notes to feedback@stansberryresearch.com. "I enjoyed Thomas Carroll's report in the Stansberry Digest on Tuesday. It reminded me of my 'retail' days as a broker 35 years ago. I had just changed firms to EF Hutton, a 'hot' firm at the time with a great ad campaign featuring John Housman (I believe) who would with regal authority finish each ad with 'When EF Hutton talks, people listen', a perfect hook demanding attention if you were a client. 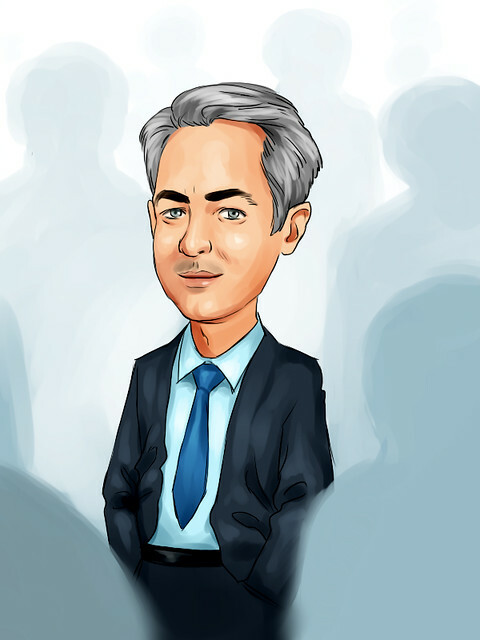 "Anyway, a couple of months after I joined the firm they had a 'squawk box' alert on a small cap over the counter stock that their fundamental analyst spoke glowing about its prospects for about 10 minutes (a long time for impatient brokers). That was followed by another 5 minutes by one of their technical [analysts] with a pitch about its chart patterns and how the stock was poised to break out with new momentum to all time highs, yada, yada. "I called a friend of mine before the market opened at another firm (Kidder Peabody at the time) and told him of our 'squawk box' alert because I knew he followed the stock also. He thanked [me] and we watched the stock start moving after the opening. But then I got a return call from him 2 hours or so later. His comment was their firm's trader had called him back after he alerted the trader earlier about Hutton's interest in the company, to say that Hutton had been on the sell side of the stock all morning. "Nice... shorting into your recommendation. I left Hutton after less than 6 months because I couldn't shake the idea that their approach to clients was 'sell them something and cast the bodies overboard.' Oh, and that company, doggone the luck; bankrupt in less than 6 months. "In my years in 'retail,' through 3 firms, I could name 2 technical analysts and 2, maybe 3 fundamental analysts I would even bother reading what they put out. That has all changed since I've become an Alliance member. Welcome aboard Tom." – Paid-up Stansberry Alliance member T.T. "Each interest rate hike takes at least 6 months to work its way into our economy. After nine hikes within a two to three year period, several increases have yet to be worked into the system. Additionally, the unloading of bonds off the balance sheet is tantamount to additional rate hikes. To this add the weakness in Europe, and you have a recipe for disaster. Only this time they didn't hike us into a recession. At least not yet." – Paid-up subscriber Charlie T.
"It's not in my nature to provide feedback, but I just can't let something as valuable and enlightening as your Morning Briefings continue to hit my inbox each morning without saying THANK YOU! "I shouldn't be surprised, because the value of all Stansberry content is fantastic... The Stansberry Digest, and the Stansberry NewsWire feeds are equally impressive. But I can't imagine that these 'free' services are viewed as a profit center, so I am compelled to write in and let you know how appreciative I am of all that you do to keep us educated and informed about what is REALLY going on that could affect our investments. You all over-deliver on your promises to your subscribers..." – Paid-up subscriber G.G. Please note: Securities appearing in the Top 10 are not necessarily recommended buys at current prices. 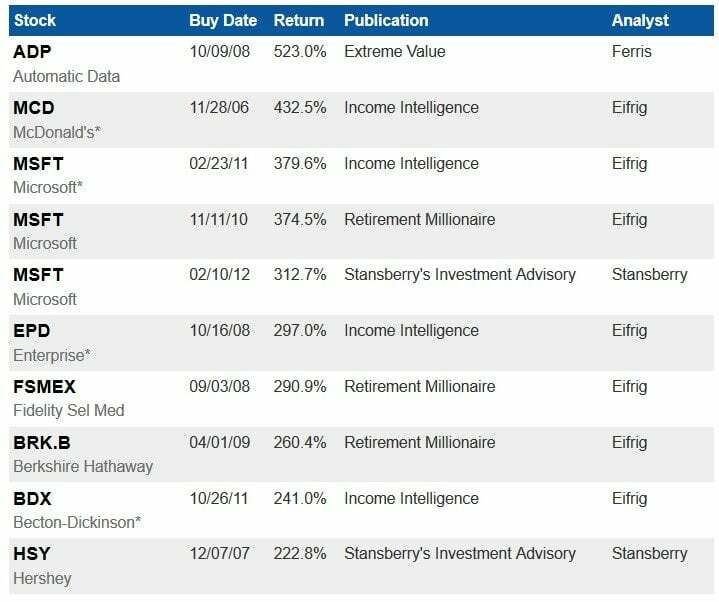 The list reflects the best-performing positions currently in the model portfolio of any Stansberry Research publication. The buy date reflects when the editor recommended the investment in the listed publication, and the return shows its performance since that date. To learn if a security is still a recommended buy today, you must be a subscriber to that publication and refer to the most recent portfolio. * Position originally recommended by Tom Dyson in The 12% Letter portfolio and carried over into Income Intelligence. Thank you for being a Model 3 reservation holder! The Standard Model 3 is official here and is now available for order! In conjunction with this new release, we have also reduced pricing on all existing trims of Model 3/S/X up to $10,000! Model 3 is now delivering on same day if we have your desired configuration available. The Federal Tax Credit ($3,750) is still available if you take delivery of your vehicle by July 1st, 2019. The California Electric Vehicle Rebate ($2,500) is still available once you’ve taken delivery of your vehicle. If you have PG&E, they offer an ($800) rebate after you’ve received your registration paperwork. Your vehicle will be eligible for the latest HOV lane sticker and will be valid until 2023. Are you still interested in moving forward with your reservation? Feel free to reply to this email when you are ready to move forward and if you have any questions.